This is the start of what I plan to be the coverage of my journey back to purple. I'll be playing Neverborn in 2015. For me, it is a return to where I started. Lilith was my first master back in Malifaux 1st Edition. While I still plan to use my old metal models, and some new-to-me metal models I picked up with the recent price reduction on Wyrd's old stock. I am really focusing on the 4 plastic boxes I have with other stuff sprinkled in. I have already assembled and primed and played a few games with Lucius (you won't see them in the list below as I've already assembled and based them). I will be building new plastic Lilith, Pandora, and Zoraida boxes. I am looking forward to this in fact. Initially, I felt overwhelmed that I'd be able to build all of these, and get them on the table with color. I even went as far to have a quote done on getting them commission painted and decided, I'd just challenge myself with painting them all myself. 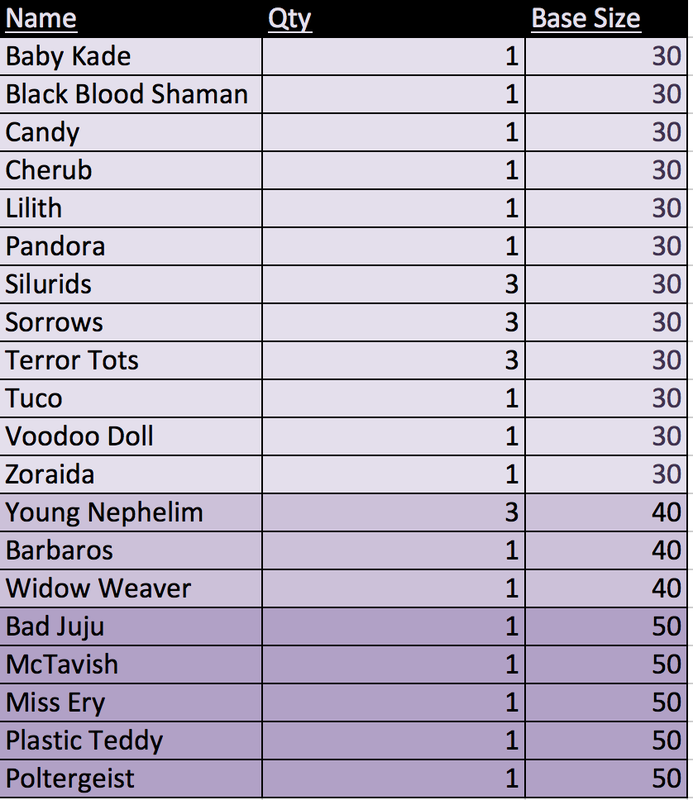 What I'm listing here is all of the stuff I plan on using for my 2015 Neverborn year that needs to get assembled, primed, and painted. I will be putting just about all of these on swamp bases from Secret Weapon miniatures. I may have missed some, but at least this is as complete of a list that I can think of right now. It comes to 18 30mm bases, 5 40mm bases, 5 50mm bases. Stay tuned as I'll try and post things up as I go both from a modeling and a gameplay perspective. As always, listen to Joe and I on Cheated Fates Radio.